This was the beginning of a love affair with the Chicago House music sound that has lasted all her life and since 2013 the realisation that, ‘yes I could actually DJ my favourite House tunes!’ came to fruition. 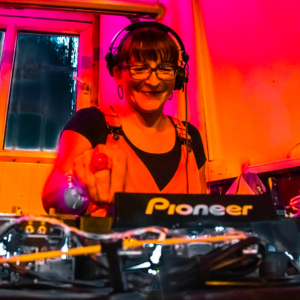 Since this epiphany she has not only gone on to teach herself how to mix and be a promoter, but get the chance to DJ in some of the finest pubs and clubs around Edinburgh including The Wee Red Bar, Cabaret Voltaire, The Street, The Wash Bar and Leith Depot. She can now be found spinning her tunes at her residency, The Village Leith, along side her very good friend and fellow DJ Hi-Tech John or hosting an Open Decks night with fellow good friend and DJ VeeringEast.